The nauseatingly cute game/toy franchise will probably hit the half-a-billion dollars mark by the end of this year. "This year Skylanders offers us multiple expansion opportunities," Activision publishing magnate, Eric Hirshberg, told investors during a "look how rich we are"-themed meeting. 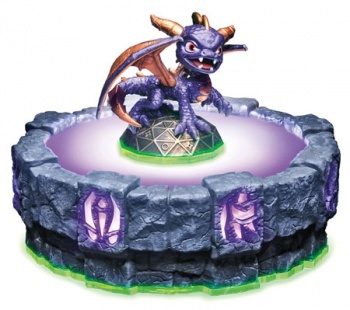 "First, simply catching up with toy demand for our best-selling family franchise, Skylanders: Spyro's Adventure. Skylanders: Spyro's Adventure was the number three best-selling video game for Q1 and for our internal estimates we believe that it was also the best-selling action figure line outpacing even Star Wars." So how many action figures does one have to sell to outstrip Star Wars? Well, thus far Activision has sold over 30 million of them - including the hideous Spyro figurine in the top right. For those of you haven't played the game, Skylanders is a decent little platformer with 32 playable characters. The catch is that the base version of the game only comes with three characters - players have to purchase action figures to gain access to the remaining characters. Just in case that wasn't enough to drive obsessive compulsive gamers, or those foolish enough to have children, into soul-crushing debt, there's even "legendary" variants of certain characters that come with different stats. While the game's success obviously pleases Hirshberg, he seems to take particular pleasure in getting one over Angry Birds creator, Rovio. "To put our performance in perspective, Skylanders has over $100 million in sales in the first quarter alone, which exceeded what Rovio, creator of Angry Birds, reported in total company revenues for all of 2011," he said, presumably while hip thrusting.